Blinds At Home is your locally owned and operated greater Indianapolis area blinds, shades & shutters expert. Blinds at Home can provide your business locations with high-quality products at a better value. Our consultants are trained experts who manage your commercial window covering projects through every phase of implementation, from design and consultation to ordering and installation. All of our products are backed by the industry’s best warranty programs to fully guarantee your satisfaction. In today’s market, the needs of each business are as unique as are the options of window solutions. Through our wide choices of vendors we provide our clients a range of solutions to meet their specific needs. 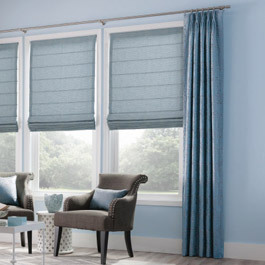 With a vast range of window treatments, window shades, safety features, colors, and styles to choose from, your company can be as selective as it needs to be. Always counting on quality products, professional consultants, and competitive pricing. Our professionals are here to provide insight into which styles, motorization options, and color palettes will best fit your company’s window covering needs. Schedule an appointment here today, and plan your consultation assured that every one of our products meets and exceeds workplace and business safety standards across multiple industries.